Retail Pro International is the retail management software for managing and fit to your business model with global support for corporate stores, outlets, single brand or multi-concept franchises, shop-in-shops, pop-ups, kiosks, and online stores. Retail Pro saves you time and money by streamlining POS, inventory management, customer experience, and more. Fusing 30 years of experience and innovation to give specialty retailers the retail management platform for the future, so you can make sense of retail complexity, pace, and trend-inspired chaos – profitably. Build engaging shopping experiences with customer-centric, consistent retail software tools at all retail touch points. Proven solution for global retailers who need robust features, support for multiple currencies, taxations, and regional regulatory policies and local support everywhere. Trusted feature-rich retail software offering an agile platform for retail regardless of your scale or business model with complete support for corporate stores, outlets, single brand or multi-concept franchises, shop-in-shops, pop-ups, kiosks, and online stores. A powerful platform for retail when you need a fully integrated, flexible solution that will grow with your business. Retail Pro gives you complete control and flexibility over tailoring the product to fit your unique business needs, workflows and processes with a scriptable web technology structure and highly adaptable API. 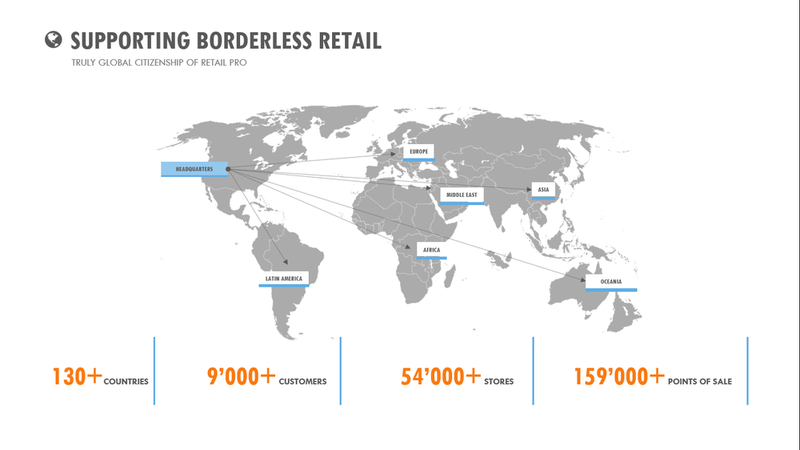 Retail Pro is designed for a global scale and with our network of globally local Retail Pro Business Partners providing region-specific support, you can scale across borders without disruption. SUPPORT any business scenario: corporate chains, franchise, shop-in-shop, kiosks, etc. Are you ready top take your business to the next level?